R Series Proportional Relief Valves protect sensitive equipment in a system with set pressure from 10 to 6000 psig (0.69 to 413 bar). SSP is one of the first companies in our industry to be certified to ISO 9001:2015. HLN Series severe service needle valves are for applications above 10,000 psig (689 bar). 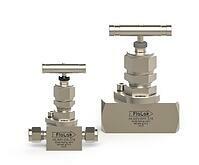 They feature a non-rotating stem with both packing and pivot above the the packing for improved valve reliability. SSP has extend it's line of LN Series Locked Bonnet Needle Valves to include LPG Series Gauge Valves and LNBB Series Block and Bleed Valves.